Roy Russell Dowling was born on 28 May 1901 at Condong, on the Tweed River, NSW. He was the sixth child of Russell Dowling, sugar-cane inspector, and his wife Lily Jane (née Ingram). In 1915 Dowling entered the Royal Australian Naval College at Jervis Bay. Although his academic performance was undistinguished, he was a natural sportsman; he was made Chief Cadet Captain and graduated as King's Gold medallist in 1918. Sent to Britain in 1919 for training with the Royal Navy, Midshipman Dowling was present at the scuttling of the German High Seas Fleet on 21 June in Scapa Flow, Orkney Islands. Next year he participated in operations in the Bosporus and the Sea of Marmara against Turkish nationalists. Having completed courses at Greenwich and Portsmouth, he returned to Australia in 1922, joined the cruiser, HMAS Adelaide, and was promoted Lieutenant in March 1923. The ship accompanied the RN's Special Service Squadron from Australia to England in 1924. With a growing reputation as a competent young officer, Dowling left Adelaide in October 1924 and completed the specialist gunnery course at Portsmouth. He came home in December 1926 and served in the destroyer depot ship, Platypus, and the destroyer, Anzac, as flotilla gunnery officer. In July 1928 he was posted to the gunnery school at Flinders Naval Depot (HMAS Cerberus), Westernport, Victoria, where he had a busy teaching schedule. On 8 May 1930 in the chapel of Melbourne Church of England Grammar School he married Jessie Spencer; they were to have five children, including two sets of twins. In December Lieutenant Commander Dowling embarked with his wife for England. From May 1931 he was gunnery officer of the light cruiser, Colombo, on the Mediterranean Station; the vessel spent six months as flagship of the Third Cruiser Squadron. Back home, in 1933-35 Dowling was squadron gunnery officer in the cruiser Canberra. Rear Admiral (Sir) Wilbraham Ford considered him an 'officer of outstanding ability'. On 10 July 1935 Dowling took charge of the gunnery school, but his prospects were tempered by the continuing effects of the Depression. Despite further good service and more golden opinions from his seniors, he had to wait until 31 December 1936 for promotion to Commander. Next month Dowling assumed command of the new sloop, HMAS Swan (II), which performed squadron work and conducted independent cruises. Baron (Earl) Gowrie and Lady Gowrie travelled with him in 1937 during part of their tour of Papua and the mandated Territory of New Guinea. Although Dowling probably enjoyed his time in Swan, he had some difficult moments and clashed on at least one occasion with Rear Admiral (Sir) Richard Lane-Poole, the Commander of the Australian Squadron. Lane-Poole recommended that Dowling gain experience as Executive Officer of a major vessel. By October 1939 he was standing by the anti-aircraft cruiser, Naiad, under construction in Britain. Completed in mid-1940, Naiad served in the British Home Fleet. A pressing need for anti-aircraft units in the Mediterranean led to her transfer there in May 1941. During operations off Crete that month, the cruiser was bombed and badly damaged. Dowling played a leading part in work which enabled her to reach harbour. Following five weeks of repairs, Naiad escorted convoys to Malta and protected the fleet from air attacks. In November she hoisted the flag of Rear Admiral (Admiral of the Fleet Sir) Philip Vian and next month took part in the first battle of Sirte in which British cruisers and destroyers drove off a more powerful Italian force. On 11 March 1942 Naiad was torpedoed by U-565 about 50 nautical miles (93km) off the coast of Egypt. She sank in little over twenty minutes with the loss of eighty-two men. A survivor of the sinking, in July 1942 Dowling became director of plans at Navy Office, Melbourne. The RAN's heavy losses continued until August and he was involved in efforts to restore the service's strength. In September 1943 he was made Acting (substantive June 1944) Captain and Deputy Chief of Naval Staff. As such, he played a key role in initial planning for the post war navy: a carrier force was envisaged as part of the measures to give the RAN greater ability to operate independently in the Pacific and Indian oceans. In November 1944 Dowling took command of the cruiser, HMAS Hobart (I), as she emerged from a prolonged refit. Strikes and an erratic supply system hampered his efforts to make the ship fully operational, but he eventually ensured that she acquitted herself well in action. Next year Hobart supported the invasions of Cebu Island, Philippines (March), Tarakan Island, Borneo (April-May), Wewak, New Guinea (May), and Brunei (June) and Balikpapan (July), Borneo. For 'outstanding courage, skill and initiative' in these operations, Dowling was awarded the Distinguished Service Order. Present at the Japanese surrender in Tokyo Bay on 2 September 1945, Hobart became the flagship of the Australian Squadron. 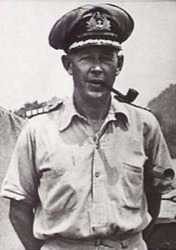 Until February 1946 Dowling acted as flag captain and chief of staff to Commodore (Vice Admiral Sir) John Collins. Although ill as a result of wartime strain, Dowling impressed Collins as a capable officer. A period of leave restored Dowling's health and in May he was appointed director of naval ordnance, torpedoes and mines at Navy Office. While this post did not have the broad responsibilities of DCNS, he had to plan for the acquisition of modern weapons and the development of manufacturing facilities to produce them in Australia. Dowling was only tangentially involved in preparations for the Fleet Air Arm, but the purchase of the first of the new carriers offered him a great opportunity. Four RAN captains senior to him had been killed in the war; of those surviving, only JM Armstrong was in the running for carrier command. When Armstrong became medically unfit for sea service, Dowling went to England in his stead and in December 1948 commissioned HMAS Sydney. Provided he were successful in the ship, he was certain to be selected for flag rank. Sydney and her air group soon established a high level of efficiency. In April 1950 Dowling left Sydney with great regret and in need of rest. He was given leave before his appointment in June as Chief of Naval Personnel. Elevated at the same time to commodore, first class, he had much of the status of a Rear Admiral. It is likely that Dowling would have later received an exchange posting with the RN, had not Rear Admiral Harold Farncomb - who was in line to succeed Collins as chief of Naval Staff - been retired in 1951. Farncomb's departure made Dowling the heir apparent. Dowling's term in charge of personnel reinforced his interest in sailors' welfare and pay. The demands of the Korean War and the expansion of the RAN in a period of low unemployment occasioned considerable manpower problems. Dowling did his best to make the navy an attractive career, recruited former RN personnel and expanded the women's service. Appointed a Commander of the Order of the British Empire (CBE) in 1953, he attended the Imperial Defence College, London, that year. On 8 July he was promoted Rear Admiral and in December assumed command of HMA Fleet. The Federal government introduced economies after hostilities ceased in Korea, and he was obliged to oversee a reduction in operations. Contrariwise, he had the pleasure of escorting the royal yacht, Gothic, during Queen Elizabeth II's tour of Australia in 1954. Superseding Collins as Chief of Naval Staff (CNS) on 24 February 1955, Dowling was promoted vice admiral and appointed a Companion of the Order of the Bath (CB) in June. His term of office was marked by continuous pressure on the RAN as the government curbed defence spending and accorded the navy the lowest priority of the three services. Collins had reluctantly decided to cancel new construction. Dowling struggled to retain the Fleet Air Arm and the aircraft carrier, HMAS Melbourne. With a limited capacity in the Naval Staff for assessing technological developments, Dowling came to rely on the advice of the British first sea lord, Earl Mountbatten, whom he admired and whose friendship he valued. The years 1955-59 marked the last flourish of the client relationship of the RAN with the RN, even though Britain was no longer able to help in maintaining those capabilities which Australians thought essential in their service. Alarmed by the expansion of the Soviet and Indonesian navies, Dowling canvassed the purchase of tactical nuclear weapons to provide some means of destroying large warships. The need for an offensive capacity of this nature and for protection against modern aircraft increasingly concerned the Naval Staff. Much of the groundwork was laid in Dowling's time for the later decision to buy American guided-missile destroyers, though he held that the RAN's primary contribution to the Western alliance should remain in anti-submarine warfare. He was one of the first to propose that the RAN be equipped with submarines and believed that they would be essential if the Fleet Air Arm could not be sustained. His long-held wish to return the RAN College from Flinders Naval Depot to Jervis Bay was realised in 1958. He moved his office to Canberra in 1959. Elevated to a Knight of the order of the British Empire (KBE) in 1957, Sir Roy anticipated retirement at the end of his term in 1959, but was unexpectedly offered the chairmanship of the Chiefs of Staff committee. Despite the position's lack of executive authority, Dowling accepted with enthusiasm. He was relieved as CNS on 22 March and took up the chairmanship next day. The office proved largely frustrating for him. Advised by Mountbatten, who was then chief of the Defence Staff in Britain, he attempted to achieve similar status and title, but the prospect of an executive head did not appeal to the services, nor to the Department of Defence, and Dowling's suggestion made little progress. He also had to preside over the decision to abandon the Fleet Air Arm - a move reversed after his retirement - and other defence cuts. Dowling retired on 28 May 1961. He remained in Canberra where he pursued an active role in the Anglican Church, of which he was a devout member, and served as Chairman (1962-67) of the local division of the Australian Red Cross Society. In July 1962 Dowling was chosen to plan the forthcoming royal tour of Australia. He threw himself into the work and in March 1963 Queen Elizabeth II invested him as Knight Commander of the Royal Victorian Order (KCVO). In November he was appointed permanent Australian secretary to the Queen. Survived by his wife, two sons and three daughters, he died of a coronary occlusion on 15 April 1969 in Canberra Hospital and was cremated.